Blogging has been light because Mrs. August and I flew to a family wedding in the northwest Denver suburbs, and we made a nice long weekend of the trip. Without the kids. Don't get me wrong... we missed them, but it was very nice to spend a few days without concern for nap times, diapers, or the availability of chocolate milk. I grew up in the Denver area, but haven't lived there for 15 years, give or take, and it was nice to get back and see the mountains again. 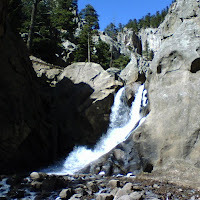 We took a quick trip up into the Flatirons -- a small range that nestles up against Boulder -- and saw Boulder Falls. As falls go, it's not too impressive, but it's a quick drive and the family members with us were able to "see the mountains" without investing an entire day to do it. As I mentioned in the comments of a previous post, I was hoping to get the first book in the Sparrowhawk series as reading material for the trip. Sadly, I wasn't able to find it in any of the major bookstores I checked, and I didn't have time to order it. Luckily, the mail came right before we left on Thursday, and The Aristotle Adventure arrived! This book was written by Burgess Laughlin, and though I'm only halfway through it, I can say with confidence that it's an amazing and substantial work. I have already learned a lot from it, and I can't wait to finish. The daily news is filled with stories of crime, famine, and tribal warfare. All these horrors are products of the irrational foundation of most world culture. But what about the good things in life -- such as the insights of science, the products of technology, and the pleasures of prosperity? Their foundation is a philosophy of reason. An indispensable tool of that philosophy is logic. That tool and that philosophy came from Aristotle around 330 BC. How did they reach us through all that time? I emphasized that the book is "in the form of a story" because it truly is. In the beginning chapters, Mr. Laughlin presents the philosophy of Aristotle, detailing the six treatises on logic, and explains in clear language what a profound achievement this was and how important it is to human life and progress. Then he takes the reader through the sometimes thrilling, sometimes disheartening tale of how Aristotle's ideas were transmitted through the ages. As I mentioned, I'm only half done so I hope to have a better review once I finish. In the meantime, I suggest you run, not walk, to the nearest web browser and order a copy of the book.